The Trump administration is poised to impose broad tariffs and/or quotas on imports of steel and aluminum products. As the issues are being pondered, battles are raging between metal-producing and consuming industries, and between the United States and its trading partners. Trade restriction in these sectors could relieve near-term pressure on thousands of jobs and, if done well, could buy valuable time that could lead to global solutions to chronic dumping and overcapacity problems centered in China and a few other countries. But tariffs and quotas in a few industries will never be sufficient to structurally rebalance U.S. trade or rebuild U.S. manufacturing, goals that have been clearly identified by the president and other members of his administration. In order to achieve these goals, the United States needs to realign the dollar to reverse the effects of more than two decades of unfair trade and currency manipulation on world trade and the global economy. U.S. steel and aluminum industries have been heavily injured by massive growth of excess capacity and overproduction in China and other countries. More than 13,000 U.S. jobs have been lost in aluminum since 2000—and 14,000 steel jobs disappeared in last two years alone. Surging imports of steel and aluminum and diminished domestic production capacity in these industries are a threat to national security because access to reliable sources of these metals is critical to supply of military equipment and critical infrastructure. If current trends persist, in time of war or other national emergency, the United States would find itself dependent on unstable import sources. Tariffs and quotas will save jobs in these industries from near-term threats and help domestic producers recover from unfair trade. In the best of cases, tariffs can be used to encourage other importers to develop common policy to address overcapacity and overproduction by China and other major exporters. But trade remedies can have negative consequences too. Increasing costs of steel and aluminum may reduce the competiveness of other domestic producers (both downstream producers of steel and aluminum products, as well as other users such as automakers and aircraft manufacturers), hurting consumers and reducing exports. Imposing trade restraints can also lead to retaliation by other countries, further reducing U.S. exports. Thus, imposing tariffs and quotas on steel and aluminum imports is, at best, only a partial solution to trade deficits and manufacturing job losses. More comprehensive and effective trade and industrial policies are needed to rebuild manufacturing. The single most effective tool available to rebalance trade and rebuild manufacturing is to re-align the U.S. dollar, which is 37 to 50 percent over-valued, relative to the currencies of China, Japan and the European Union, the major surplus economies of the world. The world needs a new Plaza accord to rebalance global trade. Currency realignment is more effective than tariffs for rebalancing trade for a number of reasons. First, lowering the value of the dollar would both stimulate exports and reduce imports. Second, currency realignment is well-recognized as a legitimate tool for rebalancing trade, and is unlikely to result in trade retaliation. Third, there are well known processes for realigning the dollar. It is not easy, but it can be done and we know that it will reduce or eliminate the trade deficit, rebuilding demand for American made goods and services. Finally, for a given initial deficit, much larger tariffs would be required to rebalance U.S. trade. Required dollar depreciation would, at most, be half as large, since a falling dollar will both stimulate exports and restrain imports. In conclusion, it is time to develop more comprehensive policies designed to result in the fundamental realignment of the dollar in order to rebalance trade and help rebuild U.S. manufacturing. U.S. steel and aluminum industries have been heavily injured by massive growth of excess capacity and overproduction in China and other countries. The patterns are similar in both industries. In steel, Chinese steel production increased from 124 million tons in 2000 to 803 million tons in 2015, an increase of 547 percent. China accounted for 88 percent of total growth in worldwide steel output in this period. Meanwhile, there is more than 700 million tons of global overcapacity in the steel industry, more than half of it in China. And China exports more steel than is produced in the United States, Mexico, and Canada, combined. As a result, annual steel production in the E.U. and the United States fell 14 percent and 23 percent, respectively, despite rapid growth in global steel consumption. Excess capacity means that steel and aluminum production facilities have the capacity to produce much more metal than markets demand. High fixed costs, capital intensity, and the large scale of production encourages state-backed producers with excess capacity to maintain production in excess of domestic demand, and to export this surplus at below-market rates. The glut of exports from global excess steel supply is targeted in particular at the U.S. market. U.S. steel imports increased from 25.9 million net tons in 2011 to a peak of 40.2 million net tons in 2014, before then falling back to 30 million tons in 2015 following imposition of anti-dumping and countervailing duties in a number of successful fair trade cases. Imports have increased 19 percent in 2017 (through March) and if sustained at the current pace, will reach 35.6 million tons this year. Since 2011, imports have increased not only in absolute terms, but also relative to domestic production and consumption, seizing more of the U.S. market and thwarting the domestic industry’s efforts to recover from the Great Recession. While U.S. steel output did recover from the depths of the Great Recession between 2009 and 2014, domestic producers have experienced declining shipments since 2014, and they suffered sharply declining revenues and employment between 2012 and 2014. As a result, the U.S. steel industry had net losses of $388 million in 2012 and $1.2 billion in 2013, and it posted net losses in four of the five years between 2009 and 2013. More recently, the U.S. steel industry lost $1.4 billion in the fourth quarter of 2015 alone, and $233 million in the first quarter of 2016, according to the U.S. China Commission (2016 annual report at 4). The surge of unfairly traded steel imports in 2014 was responsible for the elimination of 14,000 direct jobs in the U.S. steel industry between January 2015 and December 2016, and for the elimination of tens of thousands of additional jobs in industries supported by steel production. Other countries, including India and Vietnam are following China’s lead and are using government policies to support the expansion of domestic steel industries. Other countries such as such as Korea, Taiwan, Japan, Brazil, and Turkey have been found guilty of dumping and subsidizing steel products in the United States. Often, the problem starts out with dumped and subsidized steel from China, which is subject to unfair trade duties. Producers in other countries import these basic, raw materials and convert them into downstream products such as pipes, rails, bars, construction materials, and mechanical products for cars, lawn furniture, and related products. Unfortunately, under outdated U.S. fair trade laws, duties cannot be assessed on unfairly trade inputs, even though such products often make up anywhere from 50 to 85 percent of the cost of producing such downstream products. Nonetheless, producers from these other countries have frequently been found guilty of dumping and subsidizing their steel exports to the United States. In aluminum, the patterns are even more extreme. Chinese primary aluminum production increased from 2.5 million tons in 2000 to 31.2 million tons in 2016, an increase of more than 1,100 percent. China was responsible for 83 percent of the global increase in production. As a result, U.S. primary aluminum production fell 27 percent in the same period. China’s aluminum production capacity has grown even faster, increasing 1500 percent between 2000 and 2017, and it is responsible for 82 percent of the total, worldwide increase in primary aluminum capacity in this period. Aluminum, in particular, is a global commodity, and prices are primarily driven by total global supply and demand, regardless of where the aluminum is produced, sold, or stored. The U.S. aluminum market effectively imports the adverse price and volume effects of China’s capacity and production via changes in London Metal Exchange (LME) prices. Collapsing prices have decimated U.S. primary aluminum production, capacity, and employment. The LME market price of aluminum fell 39 percent between 2007 and 2016. In an industry with high fixed costs, most domestic producers have not survived this prolonged, steady price collapse Since 2000, 18 of 23 domestic smelters have shut down and more than 13,000 good domestic production jobs have disappeared, and only two smelters are fully operational at this time. The domestic industry is literally on its last legs. In both steel and aluminum, massive increases in production and exports, and dumping (sales below cost of steel products) have decimated prices and profits of private steel producers around the world. But China’s steel producers don’t have to respond to the dictates of the market. Massive, illegal subsidies for energy and power production, and for raw materials, land, and technology allow Chinese steel and aluminum producers to undersell producers from market-based economies that must purchase inputs at market-based prices. Many Chinese companies in steel and aluminum are State-Owned Enterprises (SOEs) that have access to cheap or free land, free or below-market financing and forms of public support (such as special regulatory preferences). SOEs are reported to generate 22 percent of total industrial profits in China, and represent 38 percent of industrial assets (U.S. China Commission, 2016 annual report at 92-93). Nicholas Lardy reports that state firms contribute 25 to 30 percent of China’s industrial output on average, and that “SOE contribution in some monopoly sectors can exceed 90 percent.” SOEs have contributed to the massive growth of excess capacity in both the steel and aluminum industries. In sum, U.S. steel and aluminum industries have been heavily injured by massive growth of excess capacity and overproduction in China and other countries. More than 13,000 U.S. jobs have been lost in aluminum since 2000—and 14,000 steel jobs disappeared in last two years alone. The threat to U.S. national security posed by aluminum imports is significant. The domestic industry is losing its ability to develop and supply products for U.S. defense and critical infrastructure applications. Instead, the downstream U.S. producers are becoming increasingly dependent on unreliable sources of imports from the Middle East, Russia and elsewhere. If current trends persist, in time of war or other national emergency, the United States would find itself dependent on unstable import sources. Steel and aluminum are vital for U.S. national defense and critical infrastructure. The military needs high quality steel and aluminum to make products ranging from helmets and tanks to rocket fuel, fighter jets and aircraft carriers. There is now only one domestic smelter that can make the high-purity aluminum needed for fighter jets and other military aircraft and vehicles, and to make rocket fuel. Likewise, there is only one domestic manufacturer that can make high-quality, grain-oriented electrical steel needed for transmission and distribution transformers for electricity distribution. In the wake of Superstorm Sandy, there were unnecessary delays in restoring power to areas in the Northeast because the United States no longer produced the needed electrical transformers. The effects of dumping, subsidies, excess capacity, and overproduction in steel and aluminum are pernicious and widespread. Trade remedies can help address these problems, but they must be carefully designed and targeted to be effective. Thus, as noted above, in 2015 China exported more steel than 111 million tons of basic and semi-finished steel products. However, the vast majority of China’s steel production (692 million tons, 86 percent of total output) was consumed domestically, much of it used in producing downstream manufactured products, such as auto parts, electrical appliances and machine tools, many of which were exported. Thus, China’s dumped and subsidized steel helped subsidized the production of a wide range of industrial products. And the growth of the U.S. trade deficit with China between 2001 and 2015 eliminated 3.4 million good U.S. jobs. These problems aren’t just limited to the steel and aluminum industries. China has used massive subsidies and SOEs to build a number of basic and advanced industries. At least 15 to 20 of these are now plagued by excess capacity, falling prices and dumping, in sectors ranging from chemicals, cement and ceramics to pulp and paper and solar panels (U.S. China Commission, Table 2 at 105). Trade remedies can be used to address these problems in steel and aluminum, and to increase national security and disaster preparedness. But these tools must be carefully designed to be effective, and must reflect a deep understanding of the effects of overcapacity on trade and manufacturing. For example, anti-dumping and countervailing duty complaints have been used to reduce or eliminate direct U.S. imports of many basic and semi-finished steel products from China. However, China is now a major exporter of basic steel commodities to many other countries, where it is often transformed into downstream products such as pipe, rails, and bars, as noted above, and unfair trade remedies cannot be applied to the transformed inputs. Major steel exporter’s imports of steel from China between 2009 and 2015 are shown in Figure A, below. 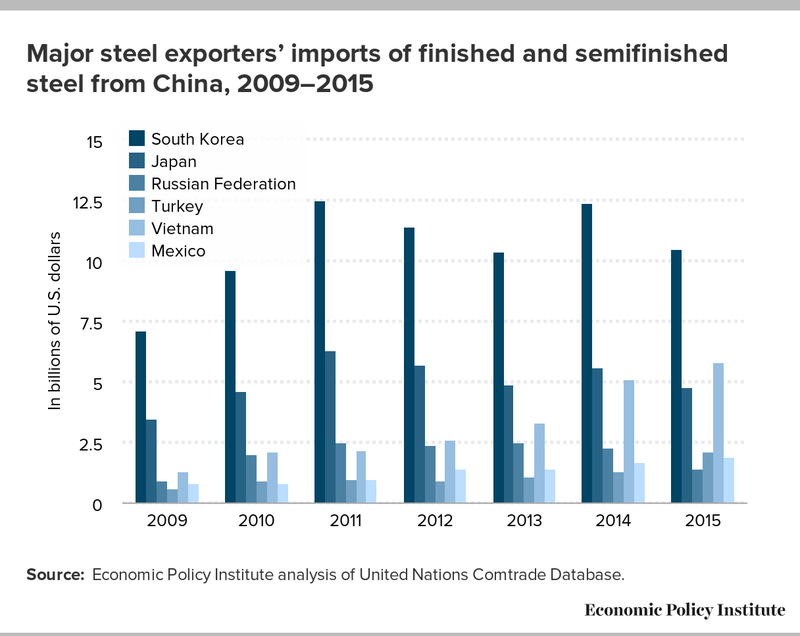 The biggest importers of Chinese steel were South Korea, and Japan, followed by the Russian Federation and Turkey. In recent years, Vietnam soared into second place among these countries, and imports by Mexico have also increased sharply. Source: Economic Policy Institute analysis of United Nations Comtrade Database. Tariffs and quotas can be used to help domestic producers recover from unfair trade. However, they must be carefully designed to eliminate excess steel and aluminum production capacity in China, and to encourage cooperative policies designed to address these problems. At a minimum, tariffs and/or quotas should be applied to all steel and aluminum products, including both basic and downstream commodities. What might such a compromise look like? It must begin from the premise that China—and some other countries such as Korea, India, and Vietnam— simply do not engage in fair trade in steel and aluminum, and have developed (or are building) massive excess production capacity in basic and downstream steel products, often with state support. One possible solution would be to apply a hefty tariff on the steel (and aluminum) content of all products imported from these countries. All countries agreeing to participate in this system would be exempt from the tariff, all others not participating would be subject to it. In this way, producers of downstream products ranging from autos to machine tools would be insulated from the effects of unfair trade. Input prices would increase, to a small degree, but all producers (both foreign and domestic) would be affected equally. Thus, in the best of cases, tariffs can be used to encourage other importers to develop common policy to address overcapacity and overproduction by China and other major exporters. However, the U.S. trade deficit in steel and aluminum products was only $60.7 billion in 2016, less than 10 percent of the total U.S. goods trade deficit of $735.5 billion in 2016. Much more needs to be done. Major steel consumers such as the auto industry will complain, loudly, about any trade remedy in the steel industry, whether they are insulated from harm or not. Their thinking is similar to someone buying handbags in a market—if you can get a Gucci bag for half off (or less) why not? But such thinking ignores the damage being done to national security and to the domestic steel and aluminum industries, and to the hundreds of thousands of workers they employ, by dumping and excess capacity in China and other unfair trading nations. Nonetheless, no matter how well-designed, trade remedies for steel and aluminum will have some costs. Increasing costs of steel and aluminum may reduce the competiveness of other domestic producers (both downstream producers of steel and aluminum products, as well as other users such as automakers and aircraft manufacturers), raising consumers’ prices and reducing exports. Imposing trade restraints can also lead to retaliation by other countries, further reducing U.S. exports. Thus the benefits of trade relief for steel and aluminum will be offset, to at least some extent, by losses in other sectors. Furthermore, the U.S. trade deficit in steel and aluminum products was only $60.7 billion in 2016, less than 10 percent of the total U.S. goods trade deficit of $735.5 billion in 2016. Much more needs to be done. For these reasons, imposing tariffs and quotas on steel and aluminum imports is, at best, only a partial solution to trade deficits and manufacturing job losses. More comprehensive and effective trade and industrial policies are needed to rebuild manufacturing. The single most effective tool available to rebalance trade and rebuild manufacturing is to re-align the U.S. dollar, which is 37 to 50 percent over-valued, relative to the currencies of China, Japan, and the European Union, the major surplus economies of the world (Bergsten 2015, Table 14-5). The world needs a new Plaza Accord to rebalance global trade. The Plaza Accord was an agreement negotiated with Japan, Germany, and other major exporters to reduce the value of the dollar vis-à-vis their currencies. The U.S. Congress threatened to impose heavy tariffs, which helped bring countries together to negotiate a currency deal. Nixon also imposed imports tariffs in 1971 in order to persuade countries to deal with an overvalued dollar. Currency realignment is more effective than tariffs for rebalancing trade for a number of reasons. First, lowering the value of the dollar would both stimulate exports and reduce imports. Second, currency realignment is well-recognized as a legitimate tool for rebalancing trade, and is unlikely to result in trade retaliation. Third, there are well known processes for realigning the dollar. It is not easy, but it can be done and we know that it will reduce or eliminate the trade deficit, rebuilding demand for American made goods and services. Finally, for a given initial deficit, much larger tariffs would be required to rebalance U.S. trade. Required dollar depreciation would, at most, be half as large, since a falling dollar will both stimulate exports and restrain imports. In fact, recent research by Joe Gagnon has shown that currency policy is much more effective than tariffs for reducing trade deficits, which is not surprising giving the broad impacts of currency values on both imports and exports. The debate over currency policy has become bogged down by discussions of currency manipulation, which can be defined as purchases of foreign assets designed to drive down the value of the manipulator’s currency, relative to its trading partners. China engaged massive currency manipulation between 2000 and 2015, a period in which it invested nearly $5 trillion in the purchase of U.S. Treasury bills and other foreign assets. This drove down the value of the yuan or Renminbi (RMB, the official name of its currency). The dollar has gained about 19 percent since mid-2014 (Scott testimony Figure B), largely due to surging private demands for U.S. dollars, to invest in U.S. stocks and other assets. As Brad Setser has noted, central banks from China and other countries are much more likely to intervene when the dollar is weak than when it is strong. Meanwhile, fifteen years of sustained currency manipulation, plus continuing support from massive state subsidies and SOE intervention have created dominant national champion industries in steel, aluminum and more than a dozen other sectors. In these two industries alone, China now produces half or more of total world output of these basic commodities, giving it an unfair leg up on competition in many other sectors that use steel and aluminum inputs. It’s no coincidence that thousands of suppliers of parts for industrial products of all kinds have offshored and outsourced production of their components to China to take advantage of these dumped and subsidized inputs. Thus, as I noted in recent testimony on causes of significant trade deficits, it will be impossible to put the evil genie of unfair trade policies back in its bottle through fair trade enforcement policies alone. Currency realignment provides the only tool available that is broad and powerful enough to provide redress for a generation or more of pervasive, widespread unfair trade policies. A fairly aligned currency is one which would support roughly balanced trade flows among all of the world’s major trading partners. This definition is not United States-centric, and does not require bilateral trade balances. The United States, Japan, and Europe are all net importers of oil and other natural resources, and will run trade deficits with some oil exporters. With balanced trade, Japan, Europe, and the United States should all be net exporters of manufactured products, and should run surpluses with some countries. But each should still have roughly balanced trade, overall. However, China and other countries in Asia and Europe are running large surpluses that show no signs of shrinking. Currency misalignment then refers to a situation where the dollar is overvalued relative to the currencies of other countries that currently have large global trade surpluses. The main offenders are China, Japan, and the EU (principally Germany and Sweden), but some smaller countries run large, persistent surpluses (and have a history of currency intervention) as well, including Korea, Taiwan, and Singapore. Overall, the dollar is 25 to 30 percent overvalued, on a trade weighted basis, relative to all its trading partners. In order to rebalance trade, the currencies of large surplus countries (China, Japan, and the EU) would have to rise by more (37 to 50 percent, as noted above). The Trump administration has developed a discouraging tendency to engage in trade policy by press release. While it has issued many proclamations and started numerous proceeding at the Commerce Department and with the U.S. Trade Representatives opening NAFTA renegotiations, there is little evidence that any of these measures have had any significant impacts on trade flows or manufacturing output. The monthly goods and services deficit in May had increased 4.0 percent over December 2016 (3 month moving averages), and manufacturing employment has been stagnant for the past three months. It is time to develop more comprehensive policies designed to result in the fundamental realignment of the dollar in order to rebalance trade and help rebuild U.S. manufacturing.